Who would have thought that Little Rock, Arkansas would have played such an integral role in the topic of desegregation? During a recent day trip to Arkansas’ capital, we took some time to visit Central High School which is renowned as being the first public school to initiate desegregation in 1957. 58 years later, this public school is now a National Historic Landmark and so we wanted to find out everything there is to know about the desegregation of Central High School! 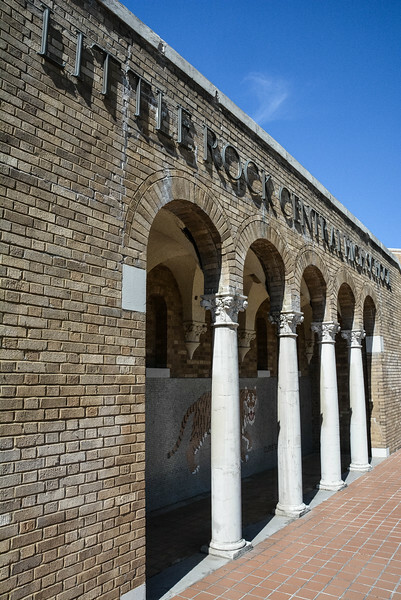 Little Rock Central High School dates back to 1927 when the initial construction was first completed. As you walk around the campus today, it’s no surprise to hear that this was dubbed as one of the most beautiful high schools in the nation. I was honestly shocked as we parked inside the visitor center and I caught glimpse of today’s school because it was certainly not what I was expecting. Let’s say I was pleasantly surprised by the magnitude and beauty of this campus! Of course renovations have taken place, but the $1.5 million initial cost which was of course a substantial amount of money in the 1920s clearly had a lasting effect on the design of this beautiful institution. 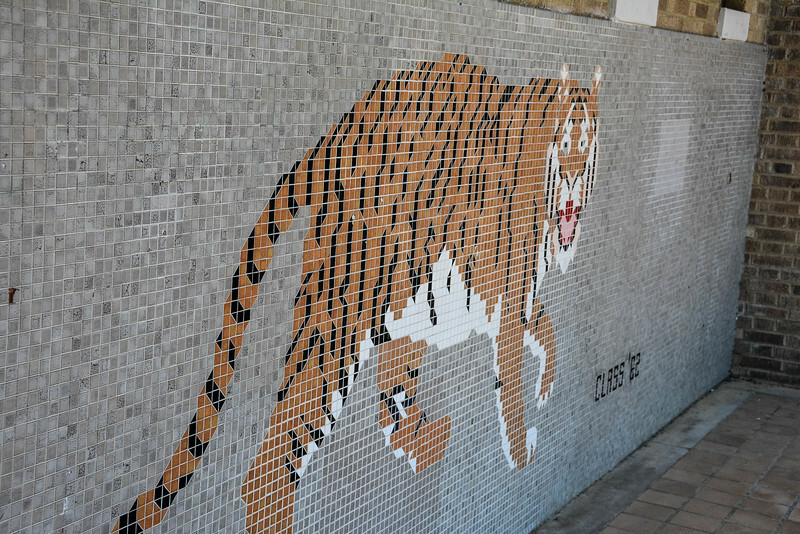 Located on Park Street in Little Rock, Arkansas, Central High School also colloquially known as ‘The Tigers’ did not start receiving the attention of current day times until the 1950s when history changing events took place here. There are many iconic dates in history but one in particular for Central High School will remain more important than anything else – September 23, 1957. 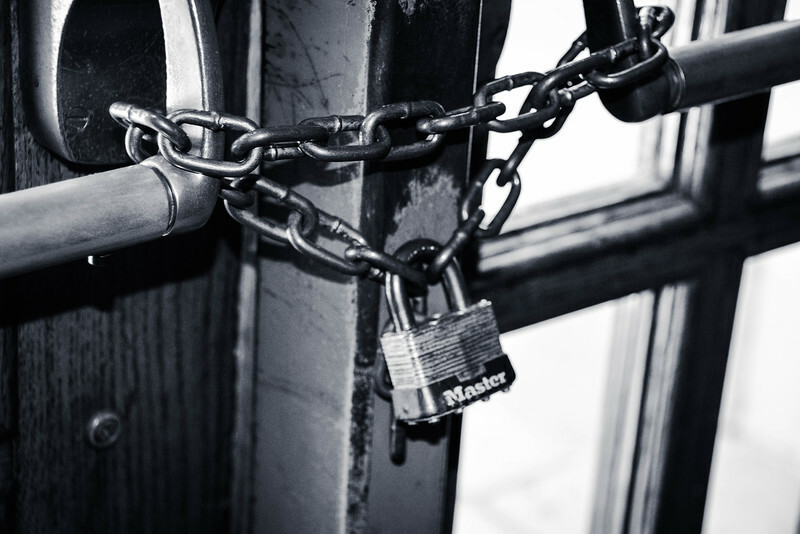 After the Supreme Court ruling in 1954 that declared public school segregation unconstitutional, schools around the nation began putting together policies and strategies to continue resisting desegregation. 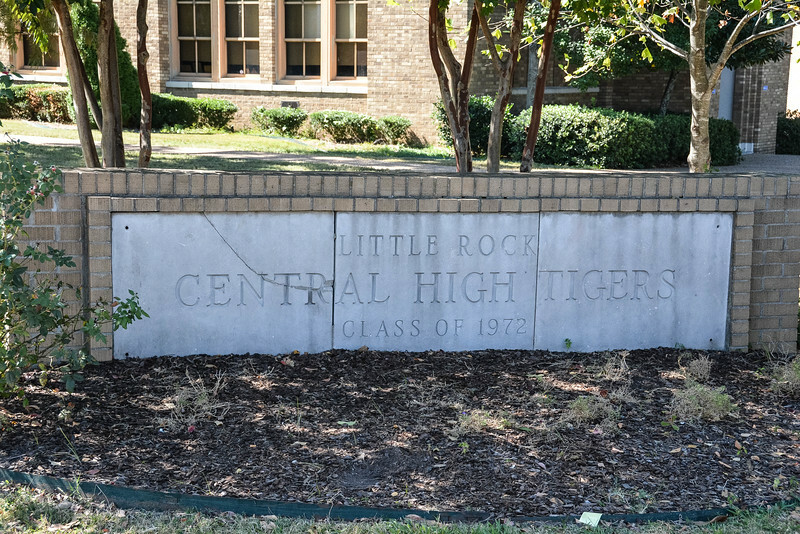 Little Rock Central High School, however indicated they would comply with the ruling and began interviewing potential students. 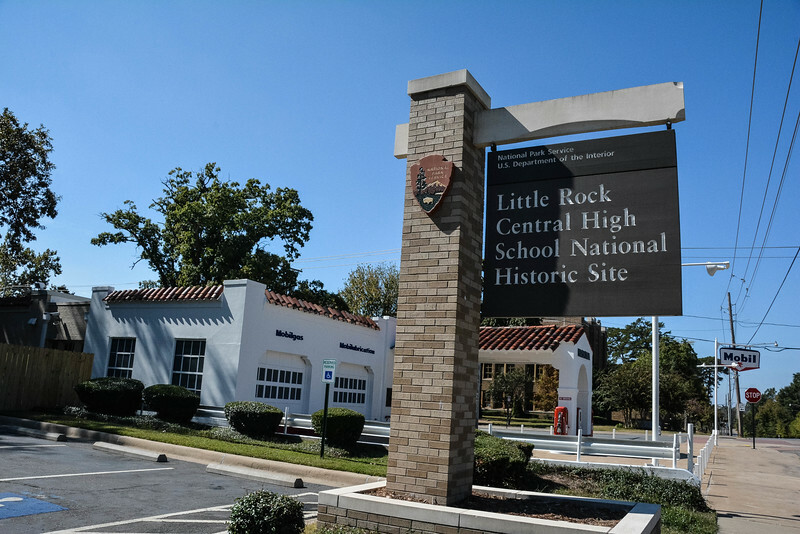 Nine African-American students had previously been denied admission into Little Rock Central High School, but on the morning of September 23 ‘The Little Rock Nine’ as they are now commonly known, made their way up the steps to the entrance of the school. Of course this wasn’t without mass protests given that Central High School was an all white school since opening in 1927 and thousands of white students, parents and local citizens voiced their anger and concerns as these nine African-Americans enrolled in classes. With help from the military, the students were escorted inside the school and the start of ‘integration’ of white and African-American students began. Over the next few years, the successful integration was seriously tested and in some cases it completely broke down due to the ‘pressure of public opinion’ but as we have seen this date in history is what led public schools around the nation to accept desegregation. 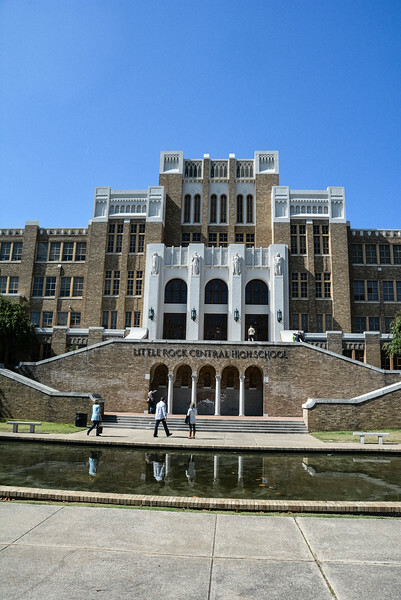 The most famous students in Central High School’s history are of course those known as ‘The Little Rock Nine’. Minnijean Brown, Elizabeth Eckford, Ernest Green, Thelma Mothershed, Melba Patillo, Gloria Ray, Terrence Roberts, Jefferson Thomas and Carlotta Walls were the distinguished nine. Green was a senior at the time and civil rights leader, Martin Luther King attended Green’s graduation at Central High School in May 1958. 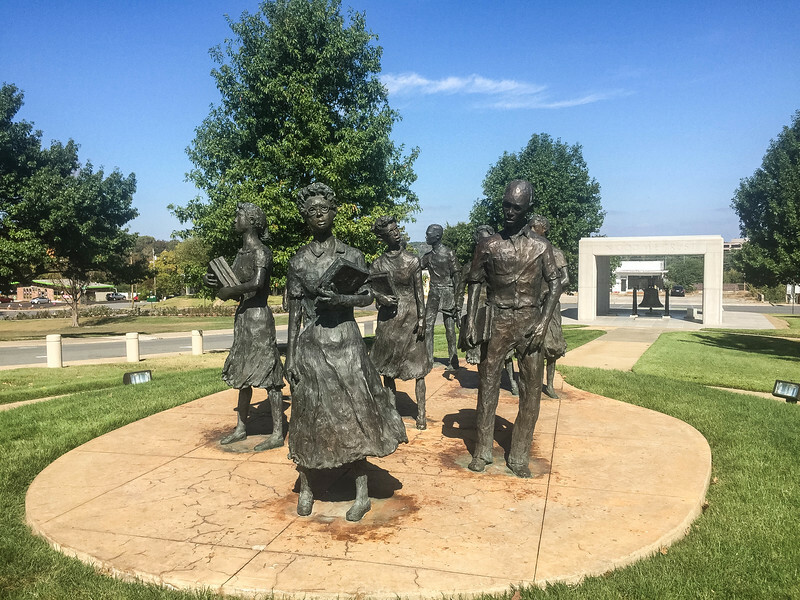 Our visit to Little Rock started at the State Capitol and as we were exploring the grounds we stumbled across the monument for the Little Rock Nine. 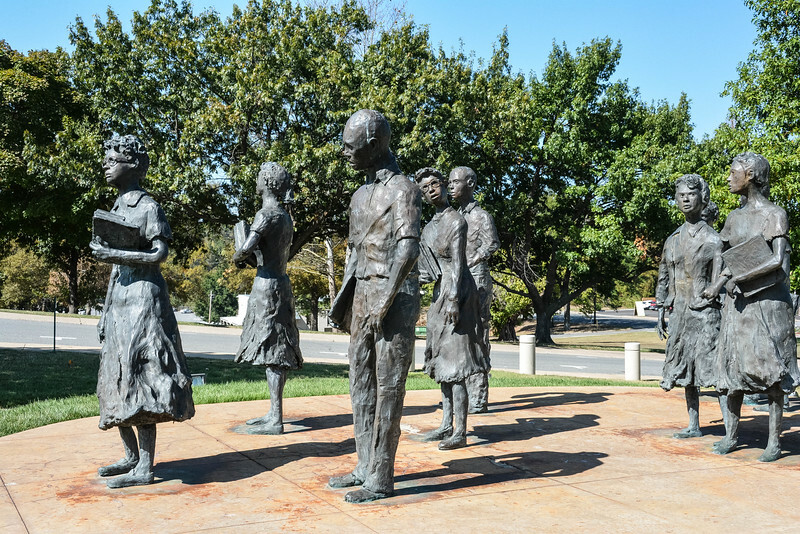 This is undoubtedly an iconic and important part of Little Rock’s history and this memorial is a tribute to years of hatred and fighting that took place before desegregation was accepted. Regardless of your age, ethnic background or race, this is a moment in history that should be recognized and appreciated all around the world so that we are all treated equally. I really enjoyed walking around the memorial and reading all of the quotes from the students themselves and how they felt about the historic day in 1957. 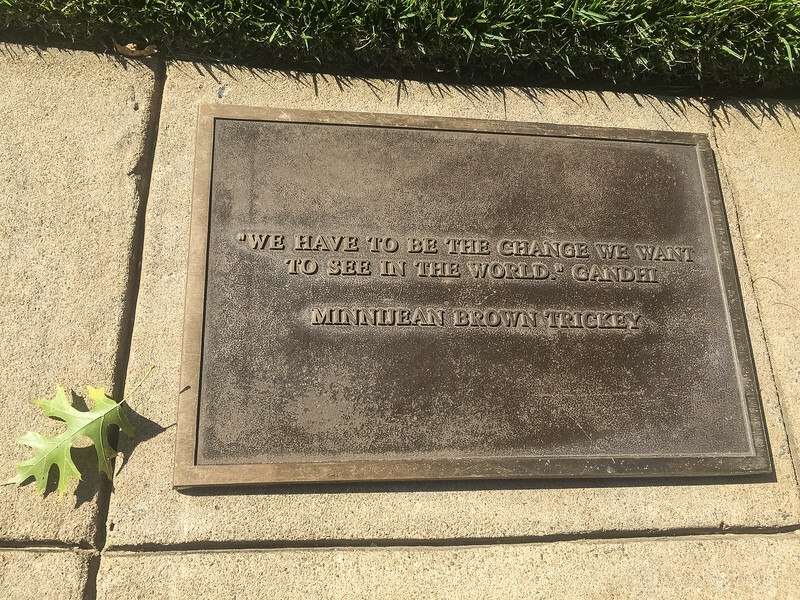 Minnijean Brown echoed Gandhi’s words when she spoke about change. Carlotta Walls emphasized that it was through sheer hard work and determination by all concerned that allowed this integration to successfully take place. Hard work, determination, persistence, and faith in God were lessons learned from my parents, Cartelyou and Juanita Walls. I was only doing what was right. Meanwhile Gloria Ray suggested that only those people that dare to challenge norms and policies will achieve change. As an individual, I think we can all learn from these quotes. No one is perfect and we all make mistakes but when you read the heartfelt quotes of individuals that literally initiated such a dramatic change in how we perceive racial discrimination, it really helps us to become better individuals in a society where we all face challenges on a day to day basis. 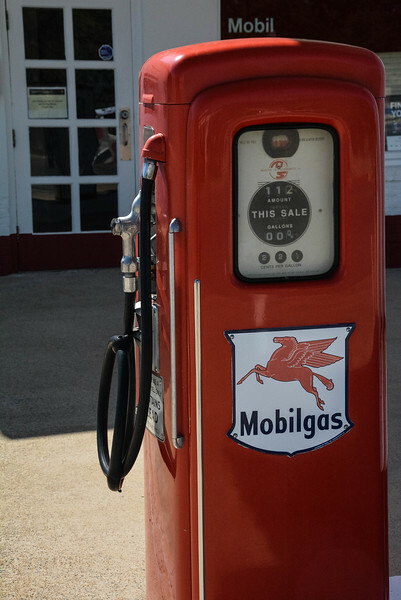 Visiting Central High School for the first time, we noticed an old yet preserved gas station named Magnolia across the road from the campus. Just like most other visitors to this historic landmark, we were curious as to the significance of the gas station in relation to the school. 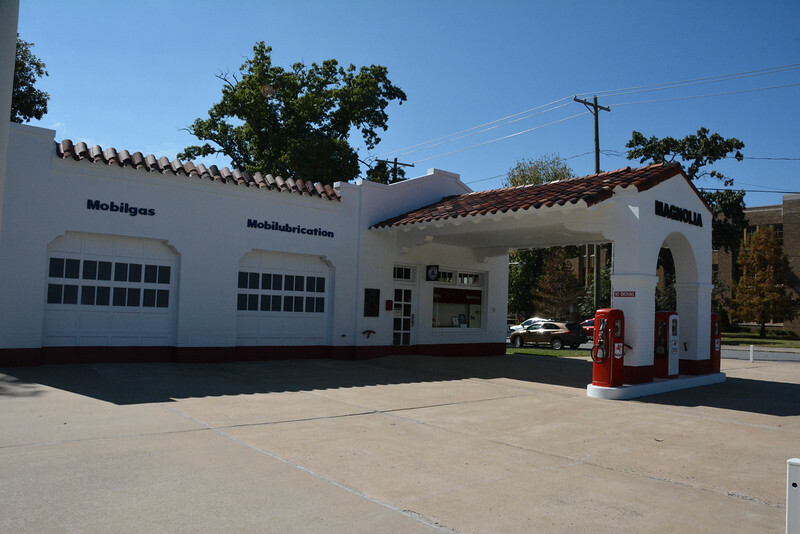 Constructed in the 1920s around the same time as Central High, this served as a hangout spot for students along with its primary purpose as a gas station. However, the real significance relates to the 1957 events as reporters from all around the world used this gas station as a spot to transmit information to their respective countries. Many businesses did not have pay phones available, so given that Magnolia was one of the few that did, it was a popular spot for reporters to feature live footage to their networks around the world. The desegregation at Central High School in 1957 has ensured that this campus will live long as an integral part in the history of civil rights. Although the campus was closed for tours (actually several class reunions were taking place during our visit), we were able to experience from the outside the beauty of this high school. 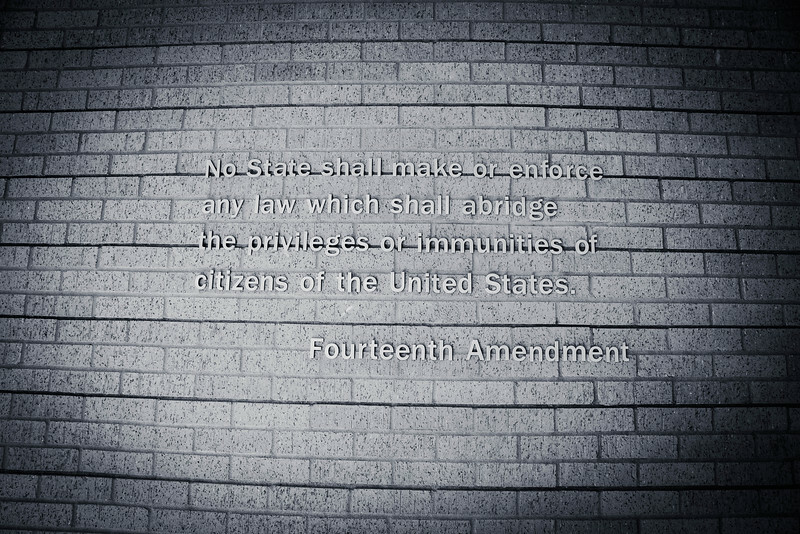 All of the memories and history that lie within these walls will likely prove to be more influential to certain people than others, but one thing that we can all agree on is that Central High School provided the first moments of treating everyone with equality and that is something that should be respected. 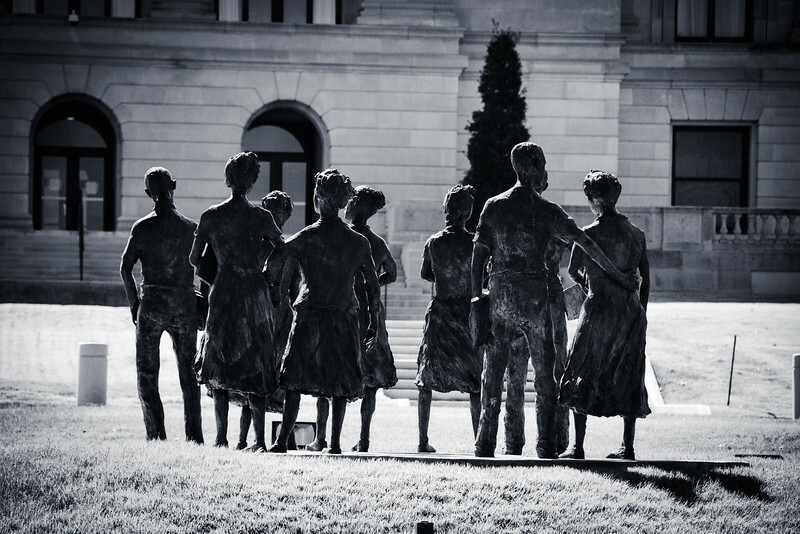 As you walk around various parts of Little Rock, Arkansas, you will be reminded of Central High School’s role in desegregation and the pinnacle of this can be found at the State Capitol building with The Little Rock Nine memorial. 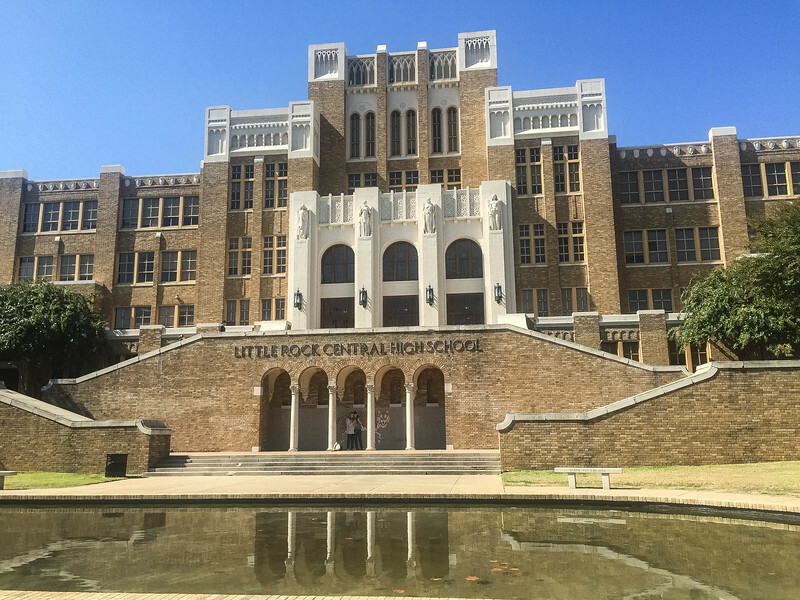 Have you visited Little Rock Central High School? 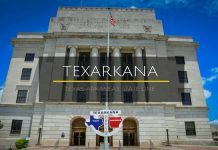 Do you have any experiences with other locations around USA that have similar impacts on the concept of desegregation? I had no idea the Central High School in Little Rock, Arkansas had such a significant claim to fame. It’s hard to imagine segregation being in place now. Thank goodness it’s long been abolished. Love the architecture of the building too. Such an iconic landmark in a relatively small city in the context of USA. But it definitely was the pinnacle of desegregation and today we can look back and see what an integral role this played in shaping our future! What a beautiful High School. I can’t believe segregation was ever allowed, so happy that things have changed since then. I really don’t know too much about U.S. history but definitely find it interesting and would love to visit this high school for myself someday. 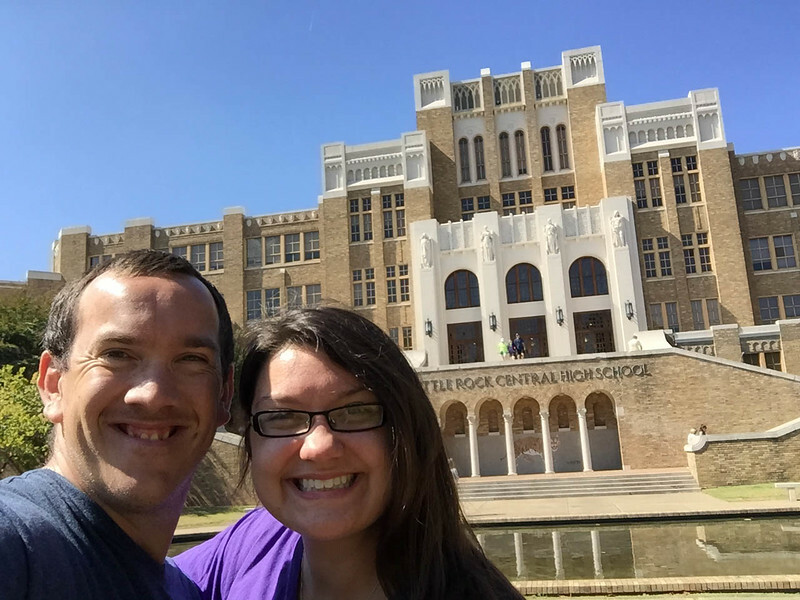 I have to admit that I had no idea about Central High School either until we visited Little Rock recently. Living only two hours away and being in Arkansas for over 6 years, I am glad I finally made the trip down to LR to experience this landmark. I know that Heather knew some of the history behind Central High but this was her first time here also. Thanks for linking up to Weekend Wanderlust this week! Hope to see you again next week! Thanks for linking up with us for Weekend Wanderlust! Hope to see you again next week! Thanks for linking up with us for Weekend Wanderlust, we really appreciate it! Thanks for linking up with us for Weekend Wanderlust! Hope to see you again for next week’s link-up! What a brave group of nine! Can you imagine the hatred and fear that must have received all in the name of getting an education. I can only imagine what it must have been like for these children. With such much going against them and all the military and police action that surrounded Central High, it must have been a traumatic experience for all concerned. But isn’t it just great to see how these nine along with others have helped shape the future of racial desegregation. The school looks very contemporary, I can’t believe it’s that old! The Nine were really brave as well as the school that decided to start a new chapter in history! I was shocked when we arrived at Central High because it was nothing at all like I anticipated! After reading stories about it, I was expecting something a lot less contemporary but of course was pleasantly surprised to see such impressive architecture. 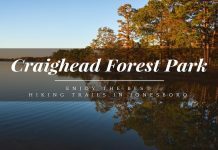 Traveling the world is an amazing experience, but this post shows how important it is to also explore places close to home. Great read! Thanks so much for your kind comments, we appreciate it. I definitely agree with you that you should always look what is right on your doorstep because there are frequently landmarks and attractions waiting to be explored that you may never have known even existed. Plus it’s nice when you find such iconic landmarks that helped shape the history and where we are today. I have been in Little Rock once, but do not recall seeing Central High. What a beautiful building where such an amazing event in history took place. Although I was fairly young at the time, I do vaguely remember these events. I lived in the pacific northwest so never lived where there was mandated segregation, although there was a certain amount of subtle de facto segregation even in the northwest. These young people who helped to break down these barriers were so incredibly brave. The bravery and hardship that these youngsters went through paved the way for the freedom of many others in the future. Both of us are too young to have experienced this concept but of course we are not ignorant to the fact that had it not been for individuals like the Little Rock Nine, who knows what mess we would be in today. Can you imagine that first walk into the school?? Terrifying…. Terrifying indeed but the bravery these kids showed has made society so much more accepting today! Hello guys, thanks for such an excellent post. 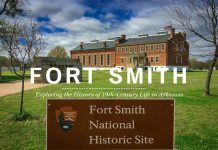 Ii is great to learn about history thru your blog. That is one impressive school. I couldn’t believe it when I saw the pictures. Cheers Ruth for your kind comments! I couldn’t believe how much history was right on our doorstep but it was great to explore and learn more about how this life-changing event took place.